Tag Archives for " The Speaker Lab "
Lots of folks seem to be teaching public speaking these days and with good reason. While becoming a sought after and highly paid speaker may be a dream for some, learning to present your ideas in a more effective manner is a good idea for all. 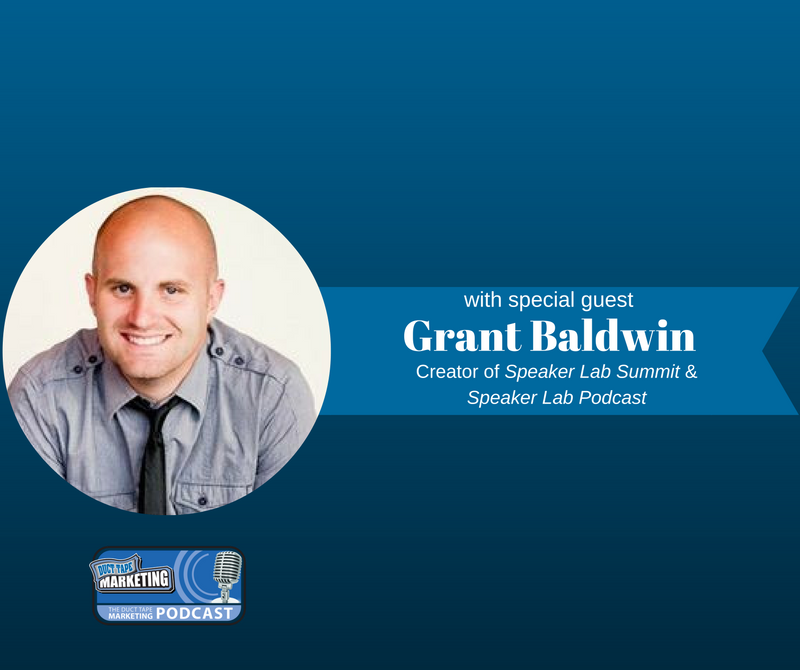 My guest for this week’s episode of the Duct Tape Marketing Podcast is Grant Baldwin, speaker, author, blogger, podcaster and founder of the Speaker Lab Podcast and the Speaker Lab Summit. Grant and I talk about how public speaking can help generate revenue – both as a profession as well as promotionally to increase sales. Grant knows all about public speaking. Starting out as a youth pastor, Grant has since evolved his love for speaking. He has presented to audiences all over the country in conferences, assemblies, conventions and other events. What are some of your resources and best strategies to improve public speaking skills? How do I start to pick up business and land paid gigs? What are some tools you use? Can you tell us a little bit about the training, workshops and courses that are currently available? Learn more about Grant Baldwin and The Speaker Lab here. This week’s episode of the Duct Tape Marketing podcast is brought to you by magicJack for BUSINESS. If you own a small business, you know that the phone is your life line. magicJack for BUSINESS will give you phone reliability for a lot less money. Sign up at magicjackforbusiness.com/ducttape and receive two months of free service and the first 100 to sign up will receive a free phone too!